Items donated to S.H.A.R.E. await to be distributed to families in Huron. Photo courtesy of Candace Myshock. A recently launched project in Huron Township is aiming to help those in need, and members of the community can lend a hand by donating items or cash to the cause. The S.H.A.R.E Project — which stands for strength, hope, awareness, relief, everyone — began last year when a group of volunteers from the Huron Township Historical Society provided a food basket, scarves, hats, gloves, mittens, pajamas and a blanket to the children of eight families in Huron Township. “Historically, people in a community looked out for each other. When a tree fell on a house, neighbors were quick to lend a hand. When tragedy struck a family, people reached out to help in many ways. It didn’t matter if it was Christmas or not. We want to bring back that feeling of security in our township year round and so this project began,” said Candace Myshock, chairperson for the project and society member. In the fall, the Huron Historical Society officially gained its 501C3 status — which is a tax-exempt nonprofit organization, and shortly after, the project was officially named. 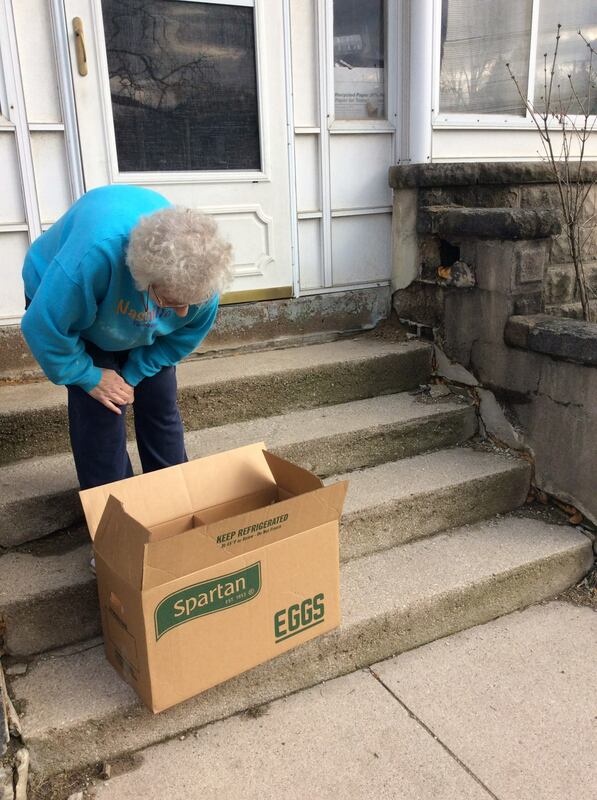 A senior citizen in Huron receives a holiday food basket. Photo courtesy of the Huron Township Historical Society. “Our goal is to be able to quickly help people, whether it be with something as simple as a weeks worth of meals or a winter coat, or a child’s weekend backpack filled with nutritious snacks,” she said. During the holidays, the Historical Society launched its first annual S.H.A.R.E food drive, receiving over 700 nonperishable food and toiletry items along with $270 in gift cards. The drive was organized to address the fact that some children in the area — who typically receive free food during school though a lunch program — need nutritious eats while they’re off during the holidays. The organization has impacted many families so far in Huron, partnering at one point with a girl scout group out of Brown Elementary, who helped provide multiple families and dozens of children with food, clothing and other necessary items. 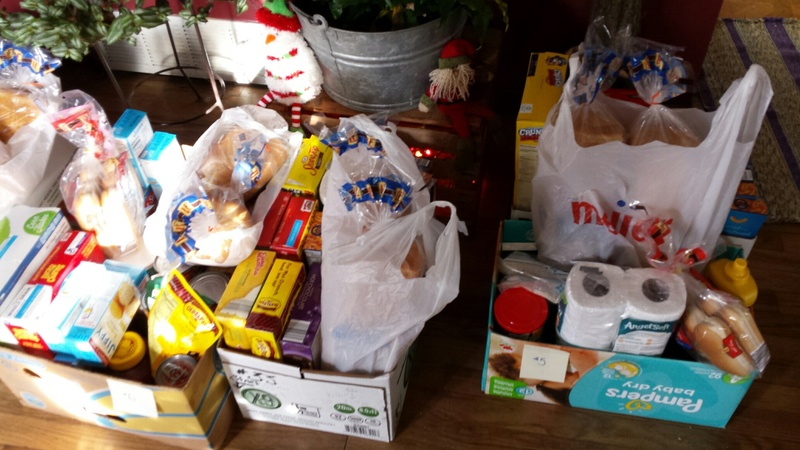 S.H.A.R.E has also helped a handful of seniors living in Huron with food for a whole week. “This is just the beginning. We are growing and working on some collaborative efforts with others in the community,” Myshock said. She expressed gratitude to multiple organizations, including, among others, the Brown Elementary PTO, girl scouts, Visteon Corp., the Huron Township Police Department, society members and multiple individuals who have helped jumpstart the cause by donating needed goods. The project is currently looking for permanent storage space to house all of its donations, which are accepted year round by contacting Myshock at 734-307-4817 or Faye Bird, co-chair, at 734-775-4747. Donations that are accepted include food, toiletries, gently used coats, snow pants, boots, new hats, scarves, gloves, backpacks, school items, gift cards and cash. Also, look for a Facebook page to launch in the future to keep the community updated on the accomplishments of the mission. This entry was posted in Community, Front Page News on January 14, 2016 by Scott Bolthouse.